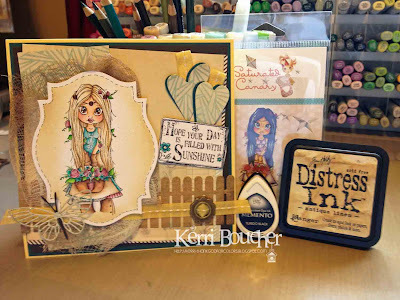 I have one last card to show you today from Karen Day our April Guest Designer! She's created another clean and colorful card for us today. I love the way she makes the image pop! Thanks again Karen for joining us! We used random.org to choose one lucky winner to win a Whimsy Stamp prize pack! 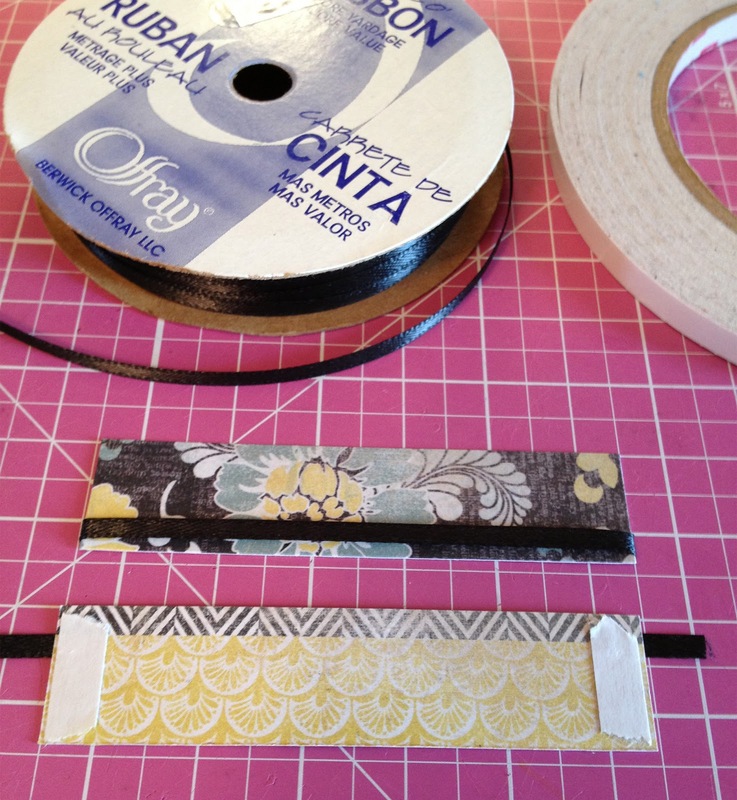 # 33 Nance from Soul Stampin!!! Please contact Lora (lora at onecrazystamper dot come) to claim your prize. Put April Challenge winner in the subject. Check back tomorrow for another fabulous challenge, inspiration, & prize!! I love this die set from My Favorite Things (currently out of stock but there are tons of great dies in the OCS store!) 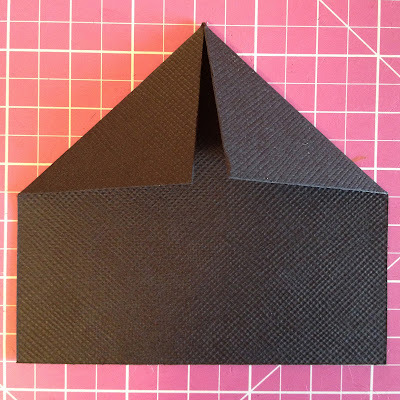 I’m really drawing to colorful cards these days so here’s a quick and easy card I made using the MFT die set. Do you love to doodle? I recently saw doodling as the theme of an online challenge and it reminded me about how I love to doodle! Do you ever do that? Get out of the habit of using a technique you love and then remember it and fall in love all over again?! I used my Uniball white pen…if you don’t own this pen, you should. Thanks for popping by and taking a look! It is a sunny and a warmer Sunday, than it has been in the past weeks. Hopefully, Spring is here to stay for awhile. 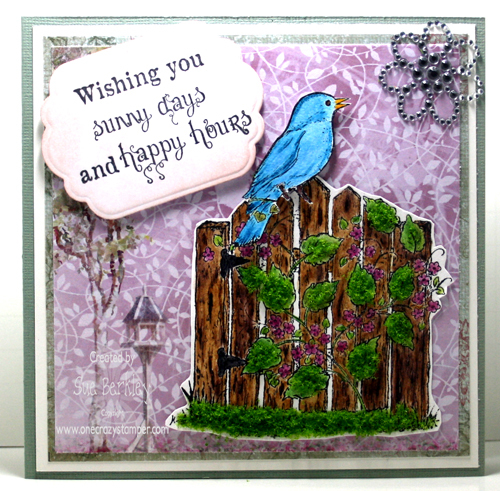 Today's card for One Crazy Stamper uses two different stamps from Heartfelt Creations called Floral Fence and Melodious Songbird. There are still a couple of days left to enter this month's Black, White + One Other Colour challenge for a chance to win a prize pack. 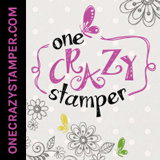 Do check out Lora's store One Crazy Stamper for all the new products that are arriving daily and the great deals. Hello and Happy Friday!!!! Wow this has been a VERY long week for me, thank goodness it is Friday and now I get to spend time with my Hubby and play in my craft room, phew! Good Morning. 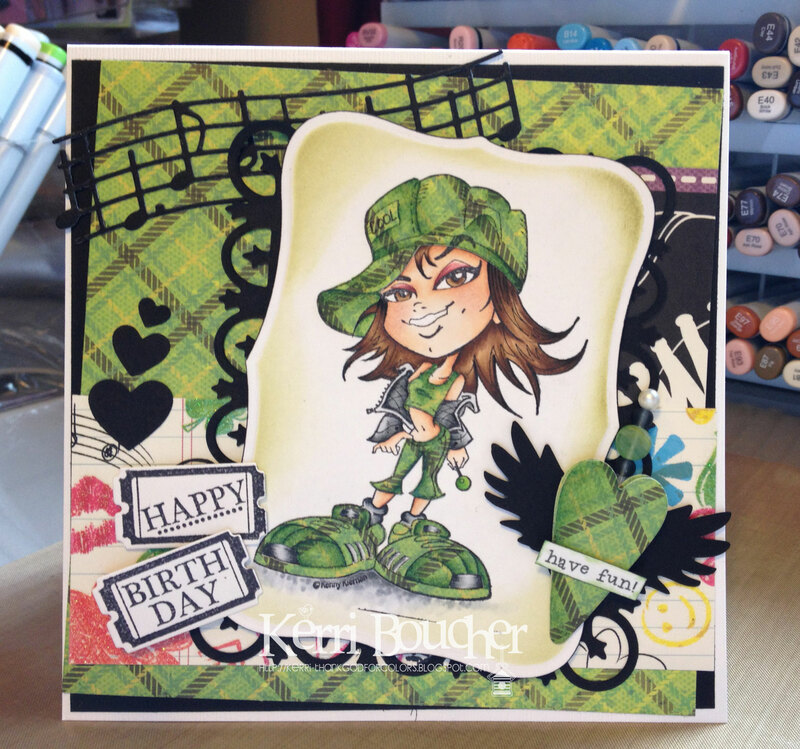 Wednesday again and my turn to post here at One Crazy Stamper. Last week was my son's birthday and this is the card I made for him. He loves country life and tractors (especially a certain brand) so I had to use this image from High Hopes Stamps coloured with my Copic markers. Thanks for stopping by today. Make it a great one!!! This week I have once again colored with my Copics, and then used Prismacolor pencils and Gamsol to add depth to this image - Wind Beneath My Wings﻿ from Whimsy Stamps artist Crissy Armstrong. 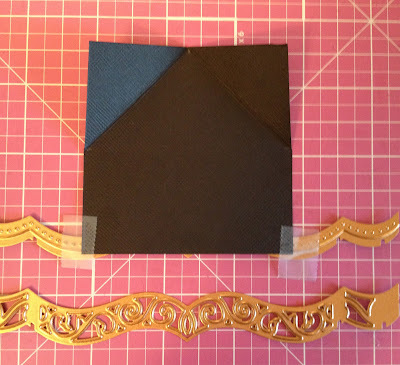 The image was cut and matted with Spellbinders Labels Twenty Eight, Star Dust Stickles were added to the wings and ribbons and Kaiser Craft Flowers were added to the card front. Recently I’ve been really drawn to cards with a full spectrum of colors! I love rainbows so I decided to make an airplane rainbow with these Lawn Fawn stamps and dies! One Crazy Stamper now carries a selection of Lawn Fawn stamps, dies and papers. If you know me, you know these stamps are “up my alley”. I’d love to hear what one of your favorite trends is in paper is? It's another cold day, even though April is almost over. Wish it would get warmer, so that we can actually enjoy Spring and all the new beginnings that it brings. 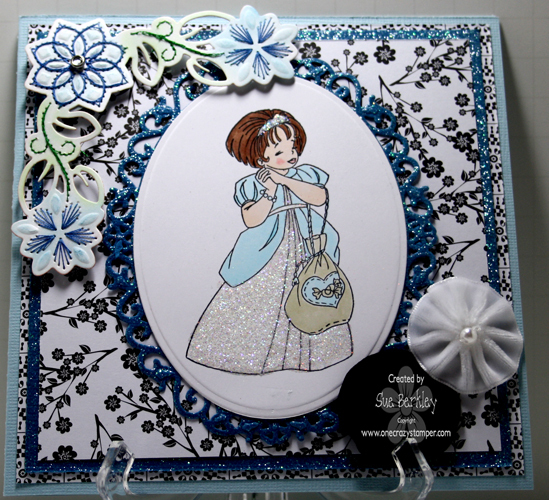 For my card today for OCS, I have used Princess Tales designed by Elisabeth Bell for Belles 'n Whistles. There is still time to enter this month's Black, White + One Other Colour for a chance to win a prize pack from One Crazy Stamper. 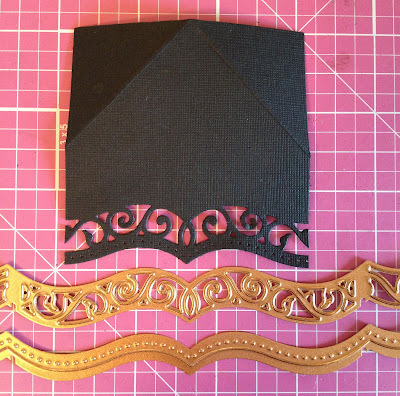 Hello crafty peeps, today I have a lovely corner bookmark to share with you. I originally saw the idea done by Beate Johns on Splitcoast, I loved it and thought it would a fun tutorial to try and share my take on it. 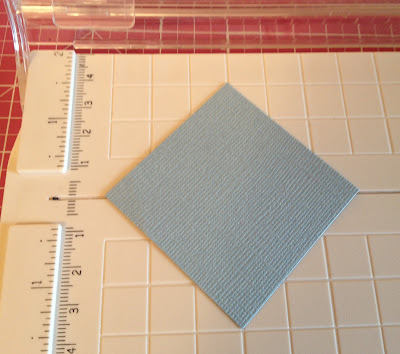 Start with a 3x3 square, on three of the sides mark the middle points. Then line up the marks and score, repeat connecting the other two marks. Fold at your score lines. 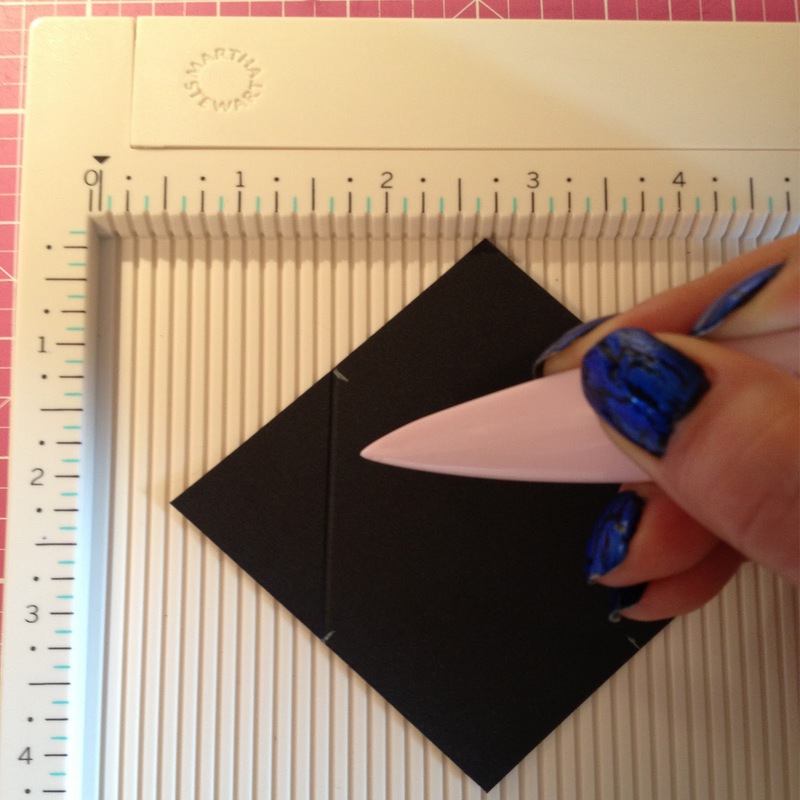 On the un-scored side use a edge die or punch to achieve a decorative edge. I used spellbinders edge and insert dies, I like to tape them in place to avoid any mess ups. 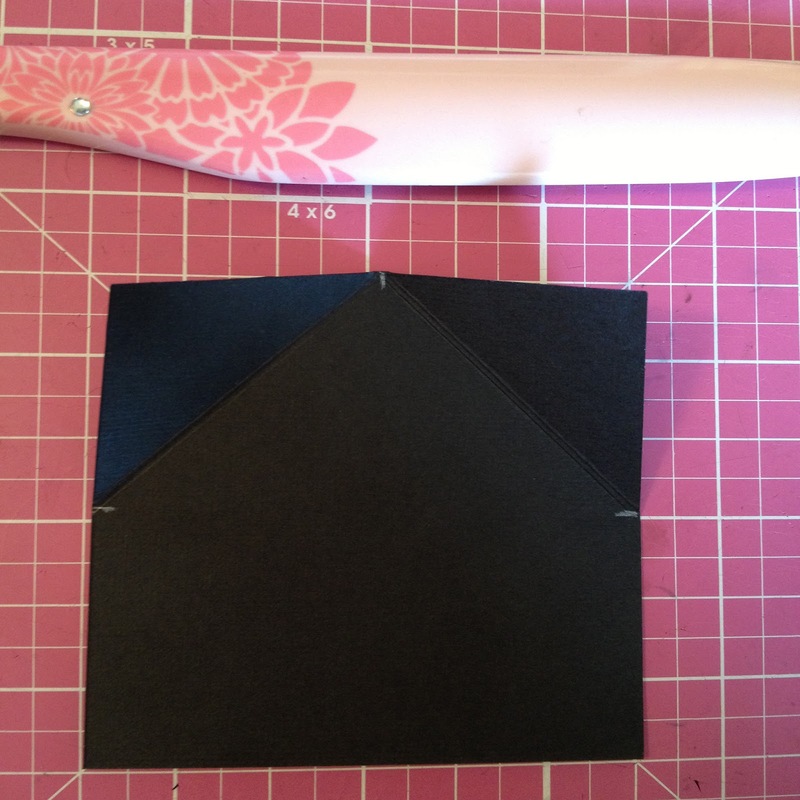 Make two die cuts using some of your smallest sizes that will fit on your folded triangle side without hanging over. I'm also using a bird die, you could use a coloured image instead if desired. 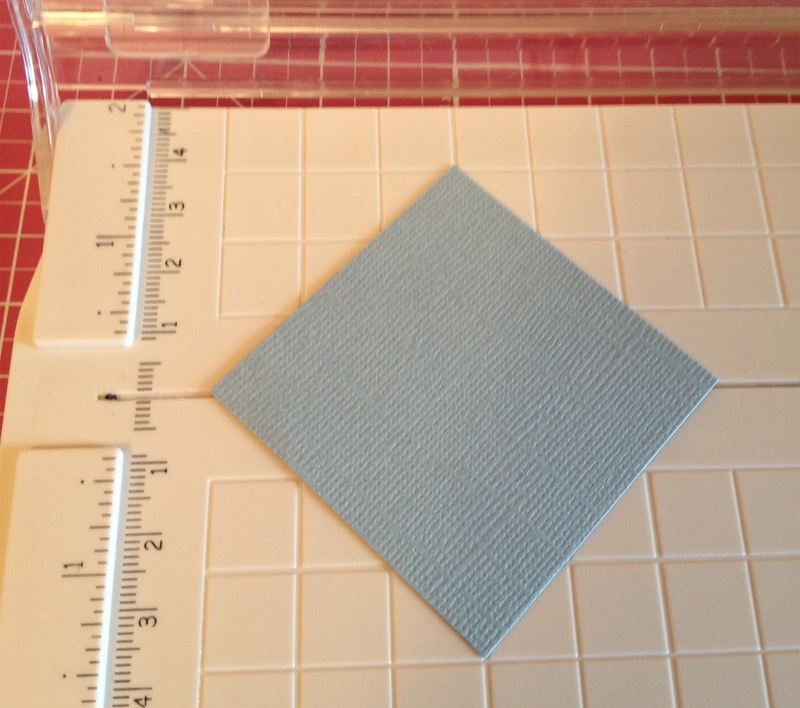 Cut a 2 and 1/8 square and then cut it in half. Using design paper make two 3 x 3/4 pieces. On the back of the design paper add adhesive and attach some ribbon. 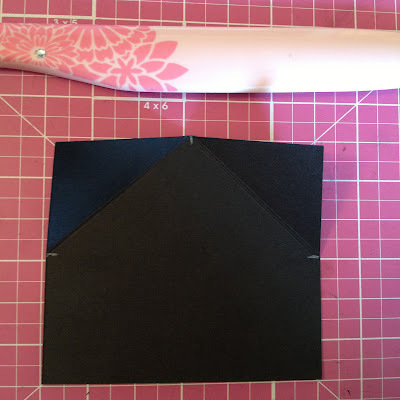 On the back attach one of triangle pieces with adhesive and then one of the other pieces of design paper below it. Finally I attached my 2nd triangle piece and then the 2nd design paper piece below it. 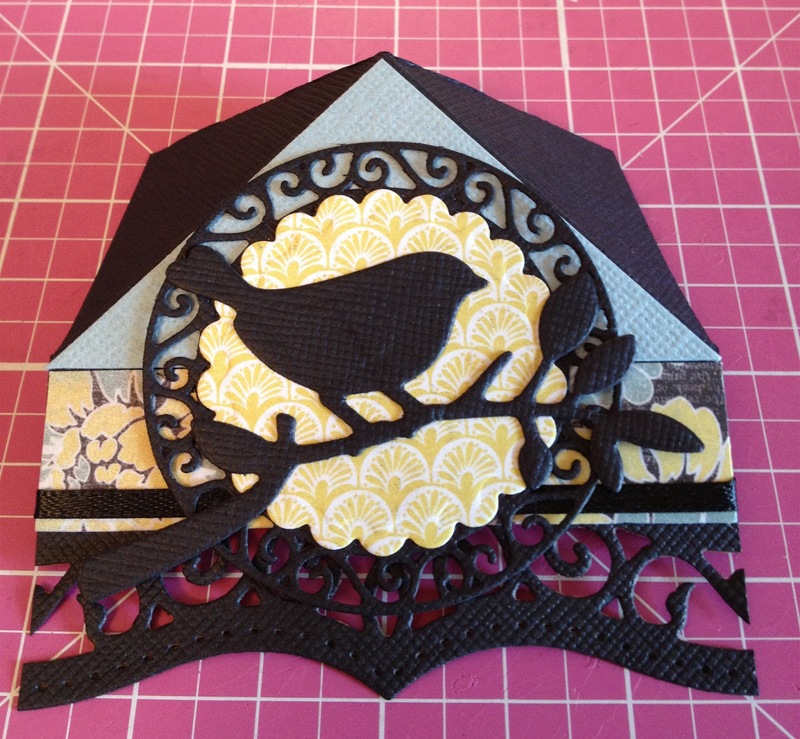 On top of that I attached my die cuts and placed the bird die as a finishing touch. 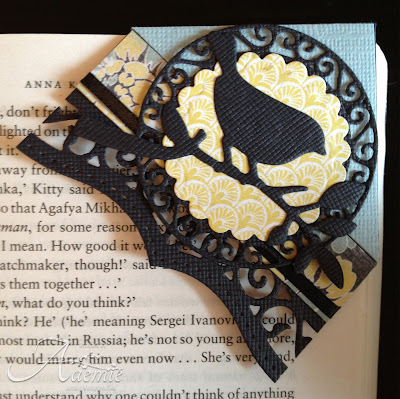 And voila a beautiful bookmark! Well that is all for me today, and I hope that I have inspired you to make a Mother's Day card for your Mom or Grandmother too! 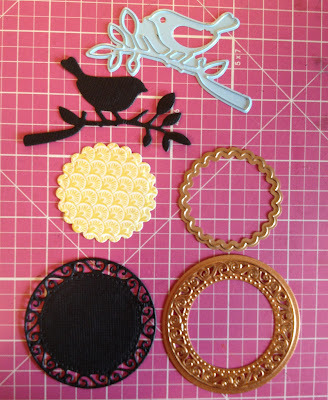 You still have time to enter your creation into out monthly challenge: Black, White + 1 Other Colour! 994 Process Red, Turquoise and Black..
Good Morning. 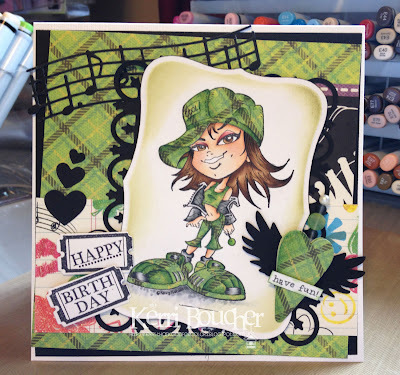 The card I have to show you today is from a new collection of stamps now available at One Crazy Stamper called Your Next Stamp Darling Diva Collection. It has rained here a lot lately so I thought she was appropriate. 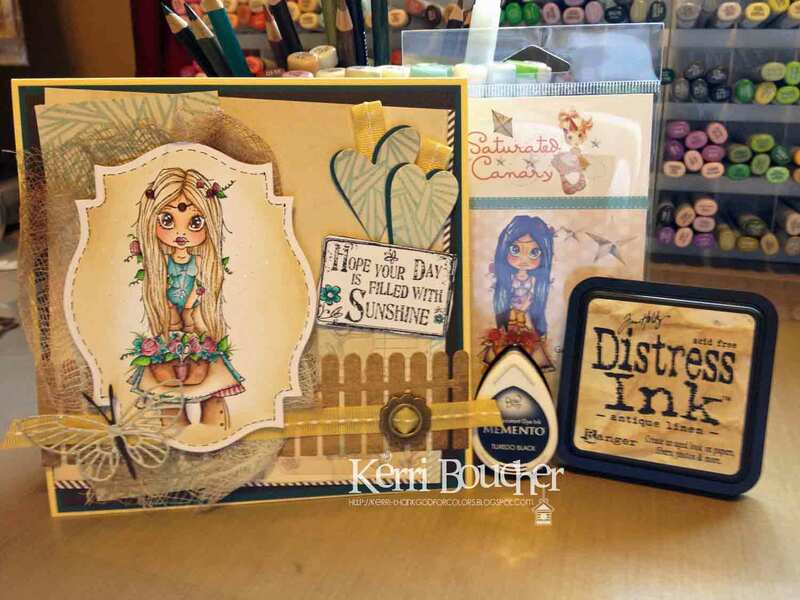 Supplies Used: Copic Xpress It Blending Card stock, Memento Tuxedo Black Ink, Your Next Stamp Darling Diva Collection "Peyton", Copic Markers, Glossy Accents, Ranger Stickles "Silver"
Thanks so much for stopping in today. Don't forget you still have time to enter our April challenge of Black, White + 1. The professional photographer produced so many beautiful photos, that it was hard to choose just some of the 2300 that she took. 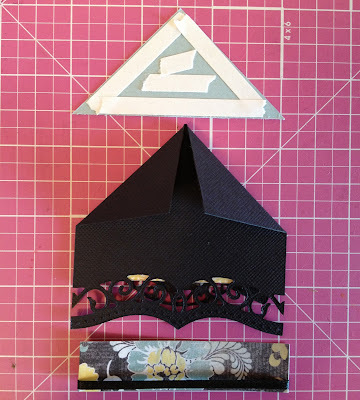 You still have a couple of weeks left to enter the challenge here at One Crazy Stamper, just click on the icon at the top of this blog for all of the details. I recently ordered Simple Stories Summer Fresh paper pack and it is AMAZING! Both of the squares of paper on my card are from that paper pack. 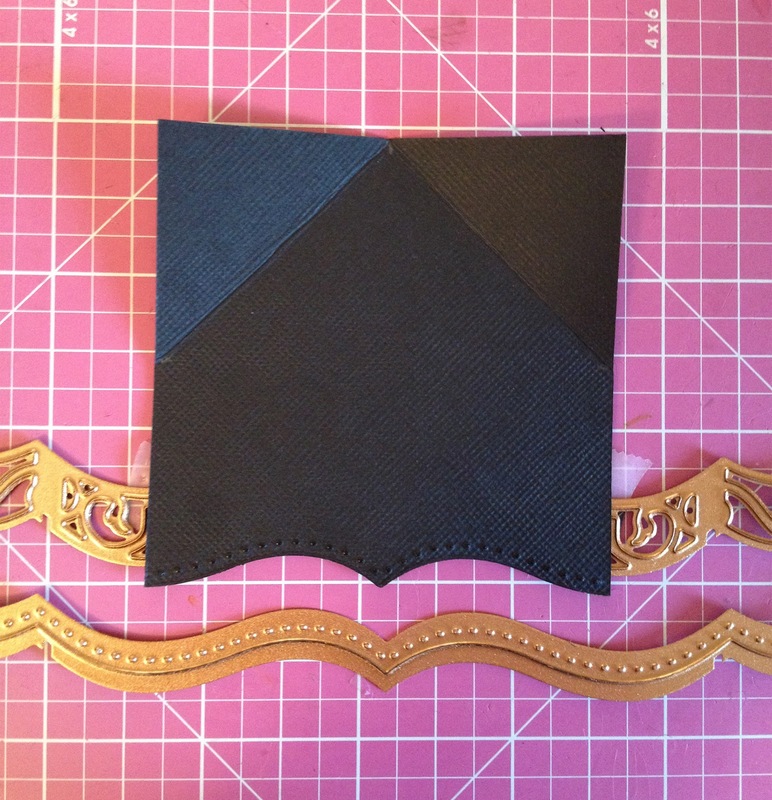 I love that the paper looks paper pieced! 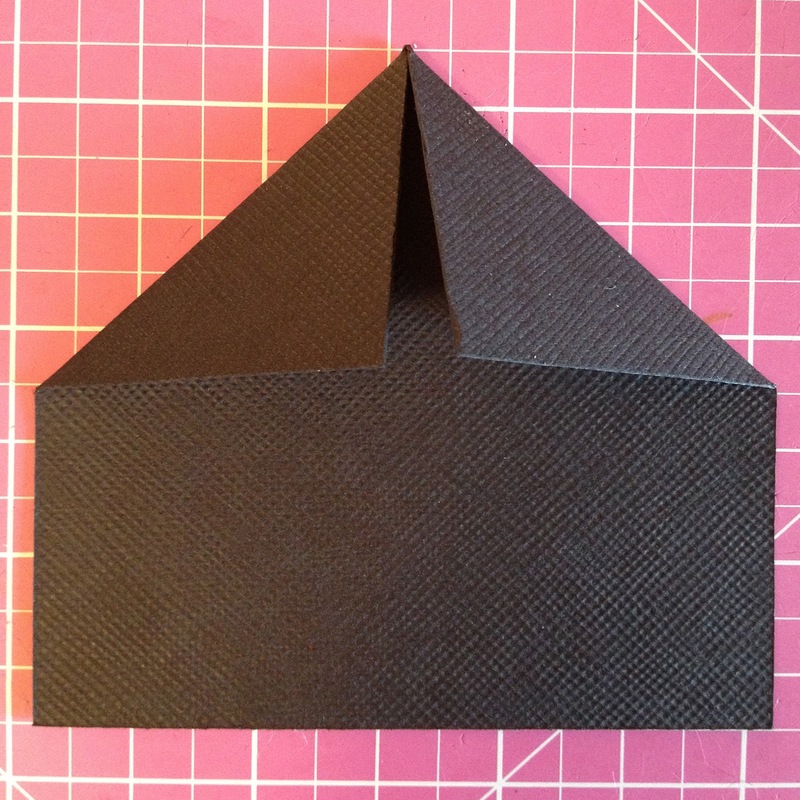 It adds layer to my card without actually adding any physical dimension. 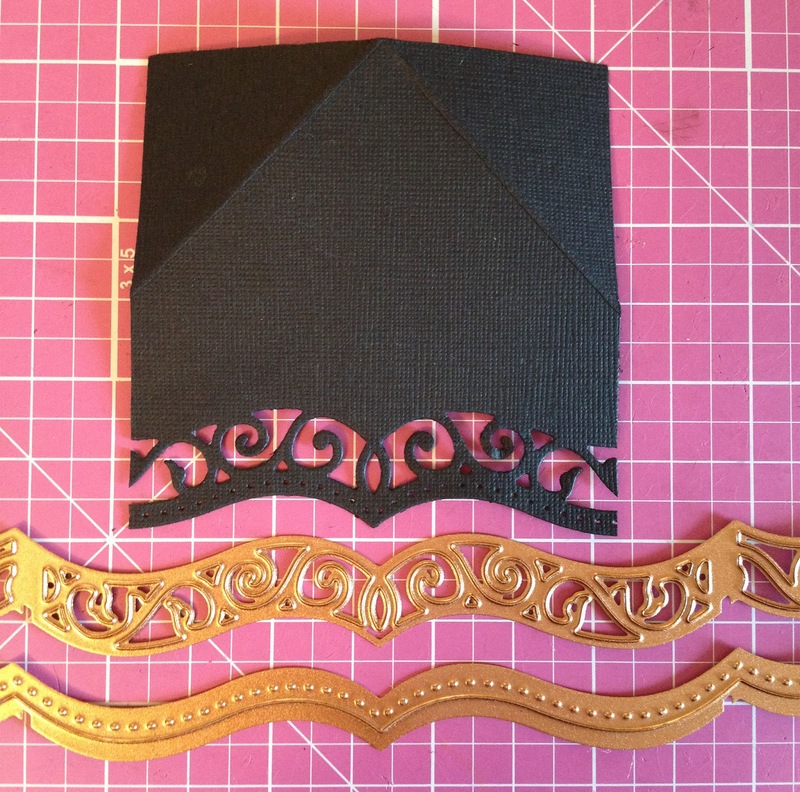 And it also has some ready made sentiment strips. 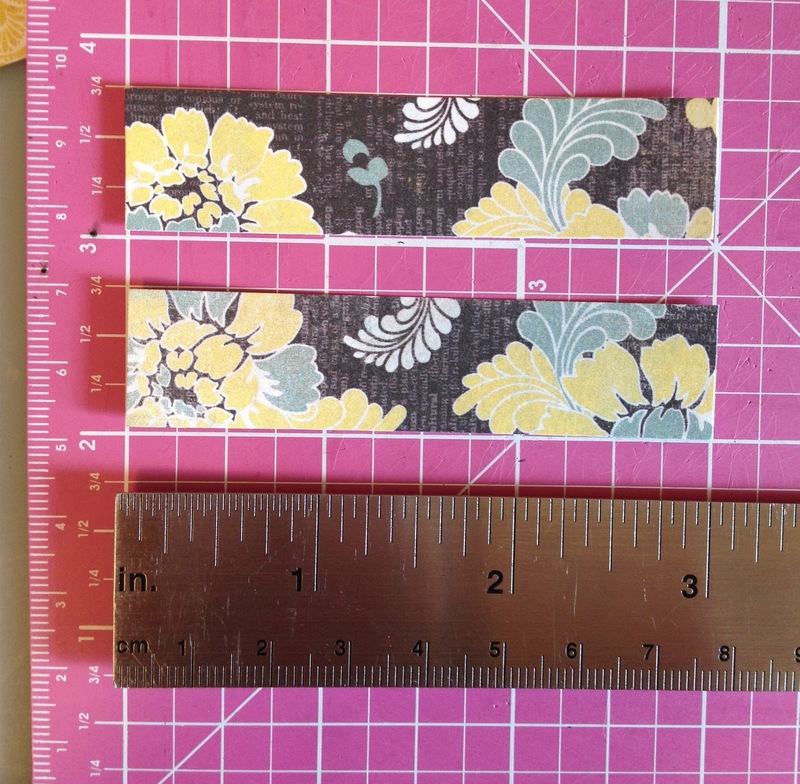 I love the patterns of the regular paper in this set also. Go take a look if you haven’t seen this paper yet! My stamp is Suspenders Saturated Canary and colored with my copics. Thanks for stopping by and taking a look!